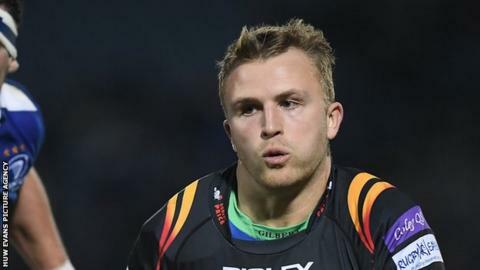 Scarlets have confirmed they are on the brink of signing Newport Gwent Dragons and Wales full-back Tom Prydie. The 25-year-old has been with Newport Gwent Dragons since 2012, making 91 appearances for the region and has scored 16 tries. "Tom is a player we have admired for some time," Scarlets general manager Jon Daniels said. "We have been in negotiations and will be delighted to confirm sometime soon he will be joining us." Prydie, who began his career with the Ospreys, became the youngest Welsh international when he made his Test debut aged 18 and 25 days when he won his first cap against Italy in March 2010. Three months later he also became Wales' youngest try scorer when he touched down against South Africa at the Millennium Stadium. Prydie won the last of his five Welsh caps against Japan in 2013. Head coach Wayne Pivac added: "He is a player who can play in more than one position, on the wing or full-back and kicks goals. "He is a young guy who has come through with a lot of talent and picked up some injuries. "He is looking for a fresh start and if he was to come to us he has the likes of Scott Williams, Hadleigh Parkes and Jonathan Davies around him and that's what is probably exciting him to play in that backline." Scarlets are looking to replace wing Liam Williams who will join Saracens next season and DTH van der Merwe who will leave for Newcastle Falcons.